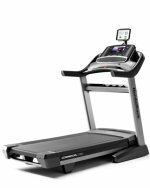 Priced under $3,000, the Precor 9.27 treadmill offers the home user the renowned Precor club quality comfort and superior engineering with no worries about repair issues. The Precor 9.27 treadmill has a backlit LCD display that shows your heart rate, calories burned, time/duration of workout, and more. The 10 programs include a 5K course, fun run, 2 heart rate, hill climb, interval, 2 walks, weight loss, and manual mode. 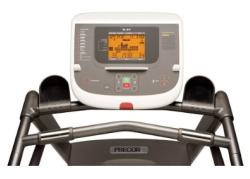 Wt / Dimensions: 238 lbs / 81" x 31" x 54"
UPDATE: The Precor 9.27 model has been discontinued and is no longer available. Check out the latest Precor treadmills at the company store to find a comparable model on sale. Powered by a cool running 3.0 hp continuous duty motor, the Precor 9.27 treadmill features a precision-machined steel drive and 2.35" rollers that keep a multi-ply belt running smooth and quiet. Underneath the treadmill deck is a multi-zone suspension system to absorb shock and lessen impact on the user’s joints. The Precor 9.27 also features handgrip sensors and wireless heart rate telemetry for accurate Target Heart Rate Zone readings during workouts. The minimalist console and sleek lines are a different look for home treadmills that have tended to look bigger and bulkier recently. 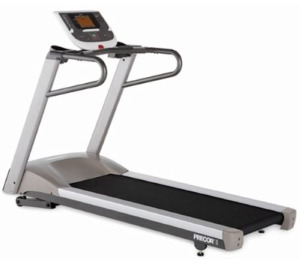 The Precor 9.27 is a more streamlined model with a smaller footprint and weight of only 238 pounds. Treadmill reviewers (especially runners) tend to prefer the added features on the higher end 9.31 and 9.35 models, which offer the patented Integrated Footplate Technology and Ground Effects Impact® Control Shock Absorption systems. While the 9.27, Precor’s mid-priced model, doesn’t offer that advanced foot strike technology, it has a few more programs plus the Heart Rate Telemetry that the 9.23 doesn’t offer. Precor has seen huge price increases for several years now as well as problems with distribution of their home fitness products because of dealers struggling in the recession. While the Precor 9.27 qualifies as a great treadmill and reviews are mostly positive by satisfied customers, paying the full MSRP of $2,999 does not make sense for the consumer looking for value in a tough economy. Unless you can find the Precor 9.27 treadmill on sale for less than $2,500, we think you will get better value by going with a Pacemaster Platinum Pro VR treadmill at $2,500 or the Sole TT8 treadmill at around $2,300. If you are primarily a walker and don’t need the hill and run programs, you can save money by going with the Precor 9.23 instead.